Are you interested in increasing your company’s brand recognition and working to generate laboratory leads and increase laboratory product sales? Biotechnology Calendar, Inc. Gold, Silver and Bronze Level sponsorship packages are an easy way to get your company’s name, products and services in front of the right customers. 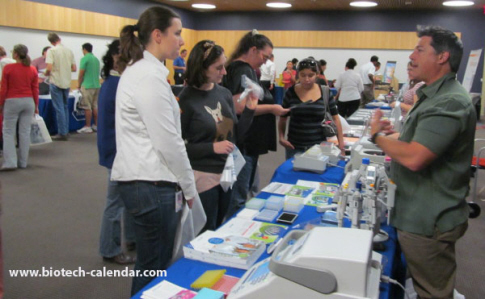 At Biotechnology Calendar, Inc. life science marketing events, our specialized services and intimate environment make it easy to showcase your company’s latest lab supplies and technologies. Exhibitors are able to have product- and research-oriented conversations with hundreds of science researchers, all in the space of a few short hours. For those looking to upgrade their event experience, our sponsorships generate laboratory leads, increase laboratory product sales and help you stand out from the competition. Science researchers love our events because they are able to discuss their latest research projects and learn about new products and services while enjoying a free, catered lunch. The convenience of our trade shows being only a short walk away from the classroom or lab makes attending our shows all the more attractive. 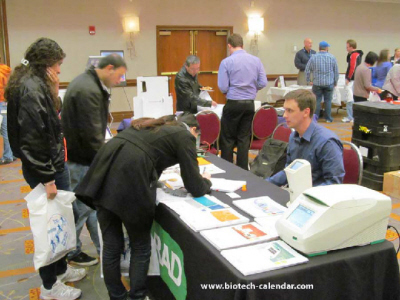 When Biotechnology Calendar, Inc. organizes and event, attendees value the time and experience spent with vendors. By promoting your brand with a Gold, Silver or Bronze sponsorship at an event where your company is already being profiled in an atmosphere conducive to researchers thinking about the companies they do business with, you can double the attention paid to your company’s products and services. Researchers will remember your company’s name when they see it in bold on the event program, on the pre-event invitations, and especially when your company is distributing exhibit bags and lanyards. Name recognition will encourage researchers to approach your exhibit table and talk to sales reps about why they should do business with you. Sales reps who want to generate laboratory leads and increase laboratory product sales at our life science marketing events can choose to promote their brand with the Bronze Level Sponsorship. This sponsorship package puts your company name on the event program, in pre-show print advertising, in pre-show web advertising and on pre-event invitations. You will also get a quarter-page black and white ad in the event program and a sponsor ribbon at your exhibitor table. A Silver Level Sponsorship will put your company name on the event program, pre-show print advertising, pre-show web advertising and pre-event invitations. You will also get a half-page black and white ad in the event program, sponsor ribbons at your exhibitor table, bold typeface on the list of companies attending, a direct link to your website, seminar space and a one-time use extended mailing list. If you are really interested in upgrading your ability to generate laboratory leads and increase laboratory product sales, you can purchase our Gold Level Sponsorship. This will put your company name on the event program, pre-show print advertising, pre-show web advertising and pre-event invitations. You will also get a full-page black and white ad in the event program; sponsor ribbons at your table; distribution rights for exhibit bags, bag inserts and lanyards; bold typeface on the list of companies attending; a direct link to your website; seminar space and a one-time use extended mailing list. Biotechnology Calendar, Inc. is a full-service science research marketing and events-planning company that organizes life science marketing events at top research institutions nationwide. If you’re interested in working to generate laboratory leads and increase laboratory product sales, we encourage you to view our 2013 calendar of events and 2014 calendar of events. For more information on our sponsorship packages, click on the button below.